When it comes to movie critics Violet Epps is a powerhouse voice. Equally unafraid of big Hollywood names and public opinion, her biting reviews are widely quoted. But when it comes to her own life, Violet finds herself unable to speak up - paralyzed by crippling social anxiety. When a chance encounter at the famous Algonquin Hotel unleashes the feisty spirit of the long-dead Dorothy Parker, the famous literary critic of the 1920’s, Violet thinks she is going crazy. 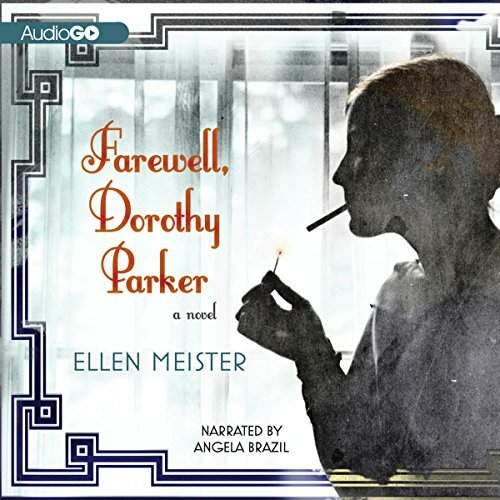 But as the rematerialized Mrs. Parker helps her face her fears, Violet realizes how much she has been missing by keeping quiet. It turns out though, that the shade has problems of her own, not the least of which include equal portions of narcissism and pessimism and the inability to move on to her afterlife. I love Dorothy Parker but didn't know much about her biography, so this is a fun, fiction intro to her life. The story of Violet was entertaining. Her fear is somewhat annoying - if I was reading, I definitely would have skimmed past her equivocating more than once - but I was entertained through the whole book. A well-spent credit. The narrator was good, but had an odd Captain Kirk thing happening where she'd shout the last word of some sentences and use strange pauses. After the first hour or so, I got over it. It didn't add to the story, but it doesn't ruin it either. Her various voices were very good, though. emotions very well as she reasds. Witty, heartfelt, & intriguing, just for starters. I could perfectly picture Mrs. Parker, & felt like I got to know her. Main character is unbelievably dense as well as a total doormat. Every conclusion she makes is the wrong one. Book is padded to the point of absurdity. This was a Bookclub pick so I had to finish reading or listening to this book I found it so boring I couldn't wait for it to end. I would never recommend this book to anyone!